Get back on the slopes again for more snowboarding fun. Try and stay ahead of the avalanches or you'll be crushed. Use the left and right arrow keys to spin backwards and forwards. Use the up arrow key to jump. Combine A, S, Z, and X to perform different grabs. Press ESC to end your run down the mountain. 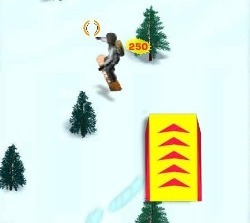 Click here to send Downhill Snowboard 3 to your friends using your default email program.